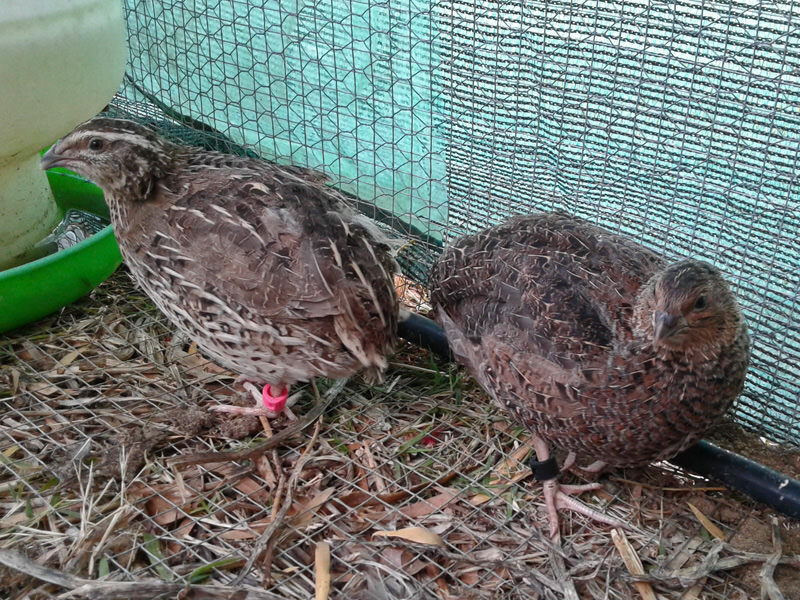 Backyard Poultry Forum • View topic - Quail chicks! Here is my latest clutch which hatched last week, all fathered by my supermarket egg male. 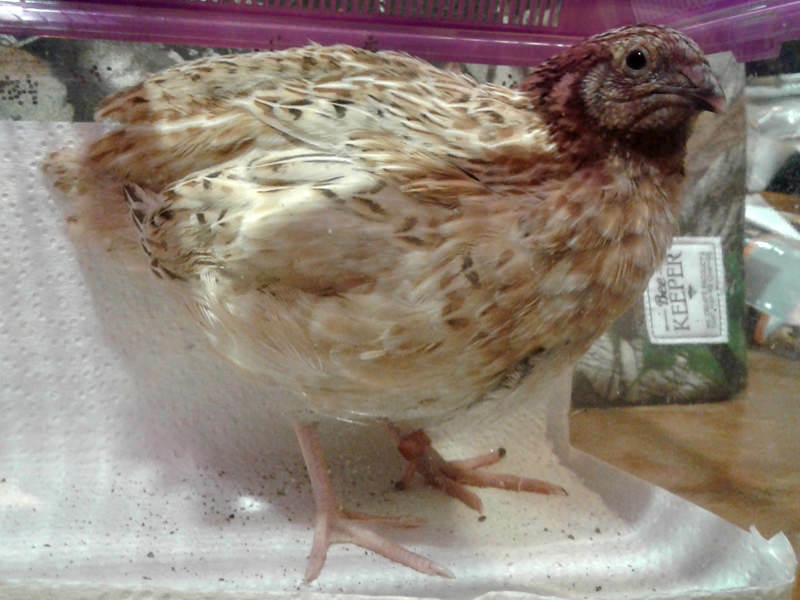 Top left: No idea, haven't seen this colour in a chick before. 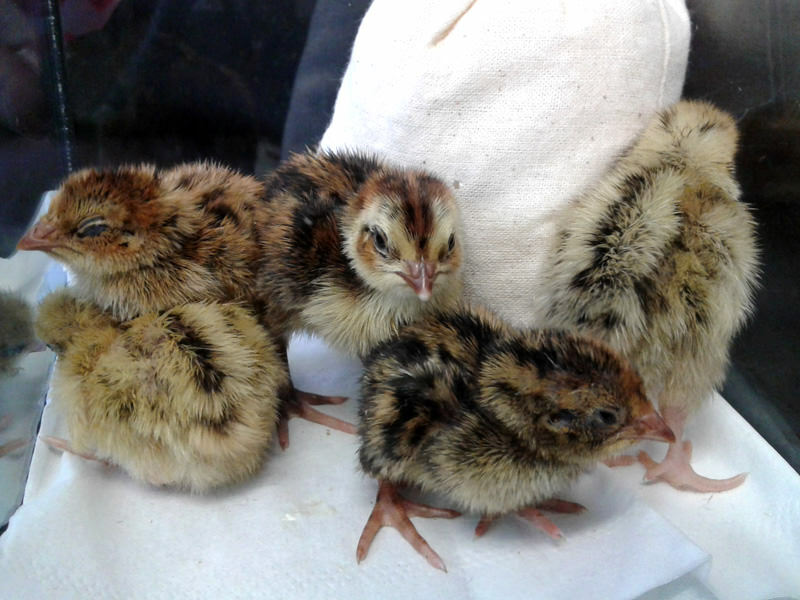 Post subject: Re: Quail chicks! 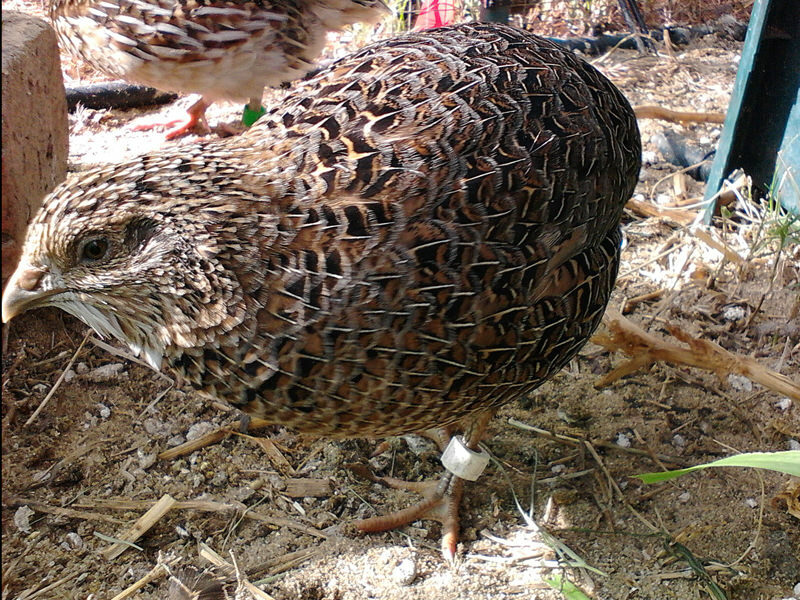 I still think it's very cool you incubated store eggs and now his producing offspring. 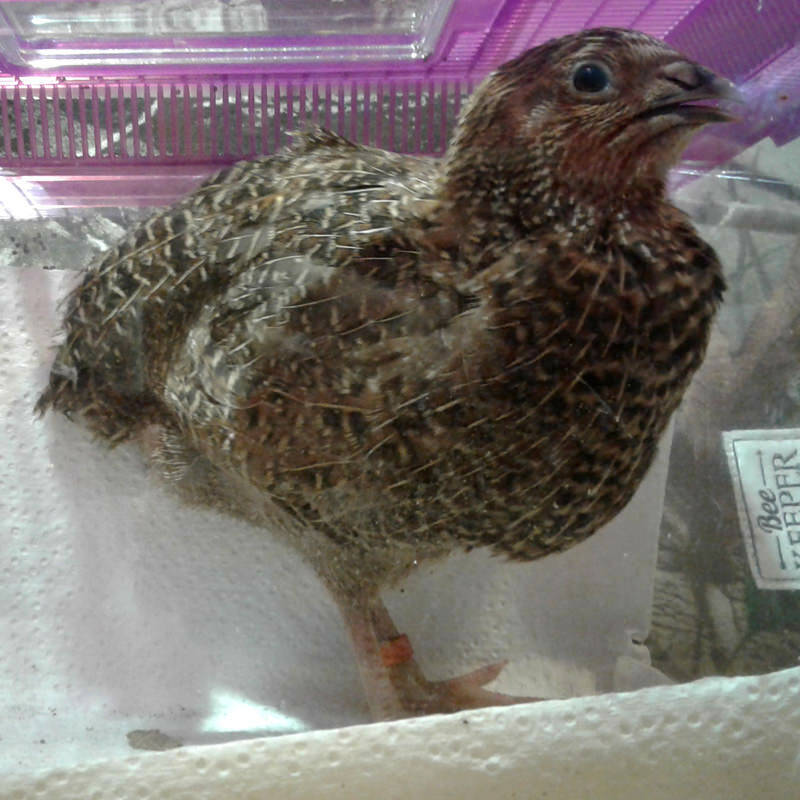 It is crazy how short the generations are, it's no wonder that quails are popular birds for genetics research. They are starting to feather out now. That top left one that I wasn't sure about seems to be rosetta, so I guess that would make the middle one tibetan. The middle one does seem darker than the others, and it's growing an interesting white bib. The others seem to be obediently growing into the colours that I said. Well they're all grown up now, and would you believe every single one is male! It's a shame that I can't keep them, but I don't think my neighbours (or I) could stand the crowing contest that is going to start soon. 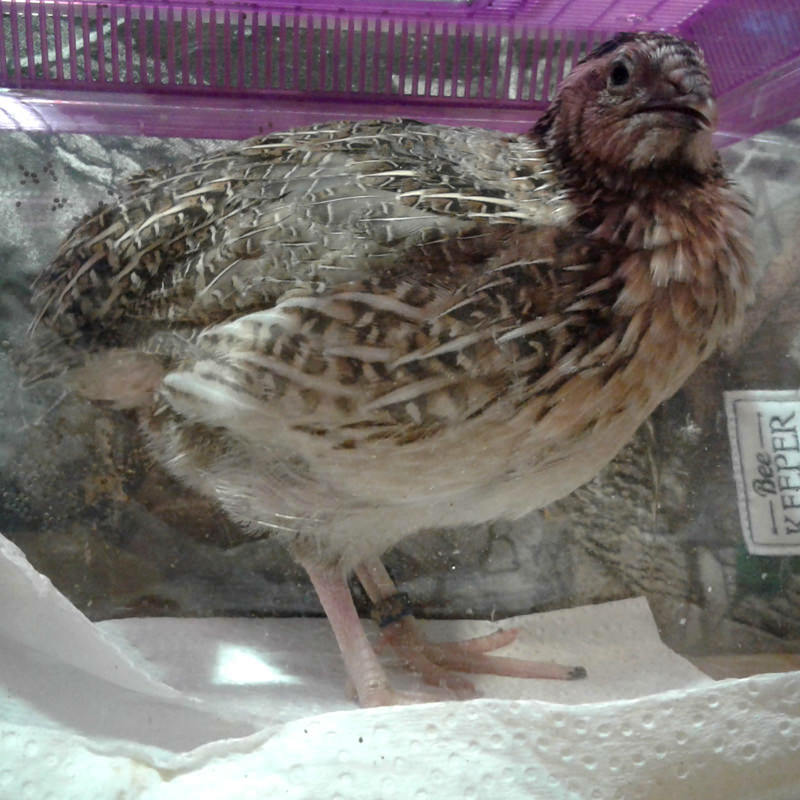 I guess the ladies will just have to wait a little longer for their retirement, luckily most of them are still laying so I should be able to get another clutch going soon. For future reference, this is what colours they turned out to be. 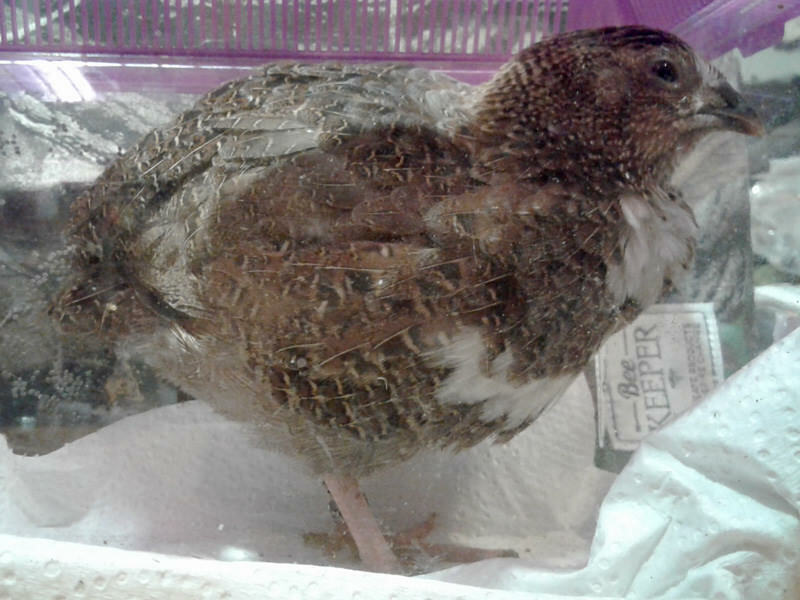 Could you help explain the features of quail gender to a complete novice, KChook? What is it about these littlies, that makes them males? Sure thing! I'm not an expert though, so take all this with a grain of salt. The second and third ones are both either Italian or Manchurian, if they were female they would have less dark faces and no dark chin stripe. 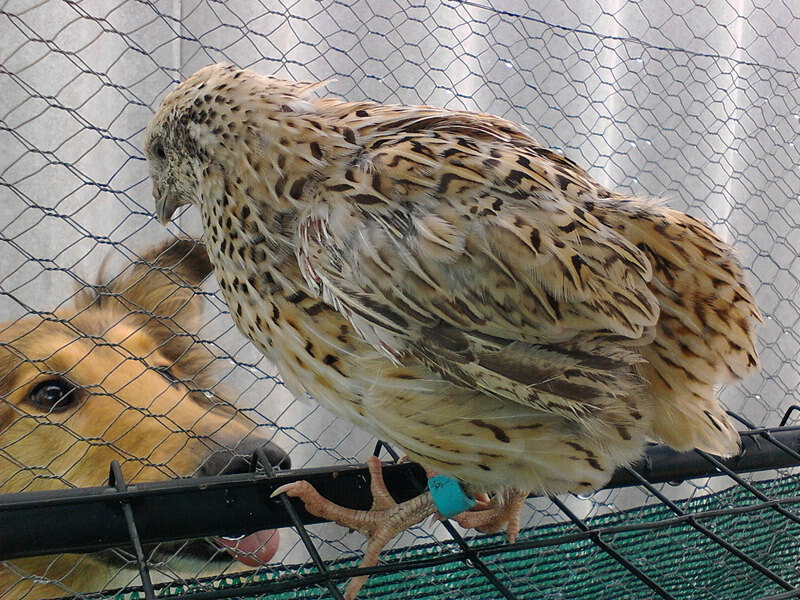 A speckled breast would also mean a female but a lack of speckles doesn't guarantee a male in these colours. I've also caught them crowing. 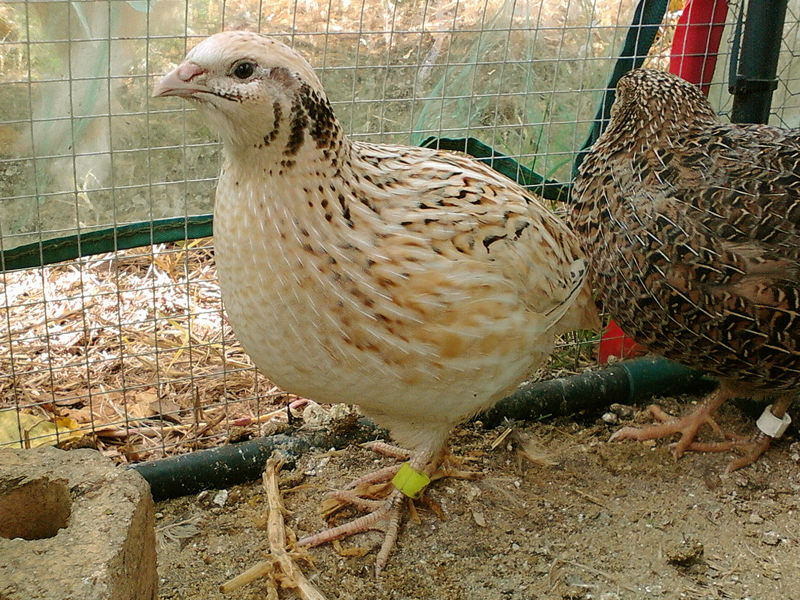 The fourth is a typical wild type, aka Pharaoh , speckled breast for female and plain reddish breast for males. 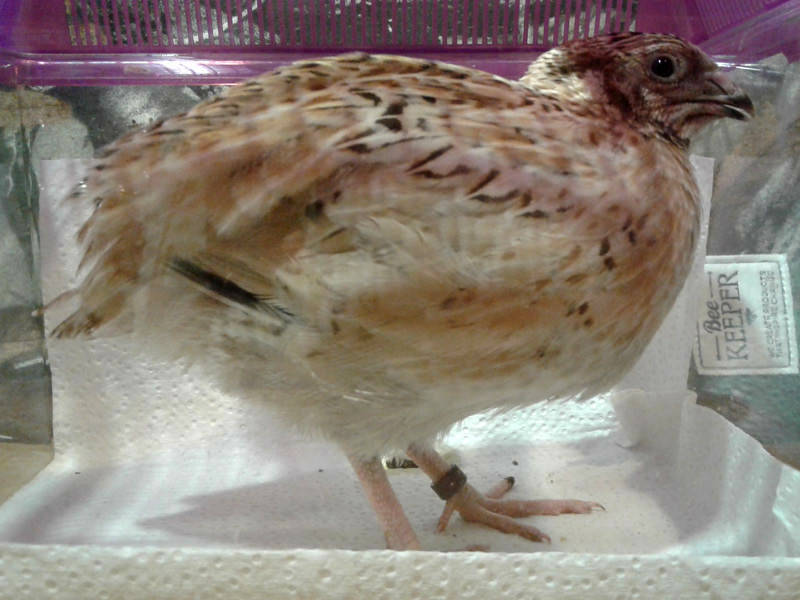 Males do have speckled breasts when they first feather out but it changes to plain reddish at about week 4. The first one is Rosetta and last one is either a dark Rosetta or Tibetan, they are impossible to tell from the colour as far as I know, but I have seen them crowing. 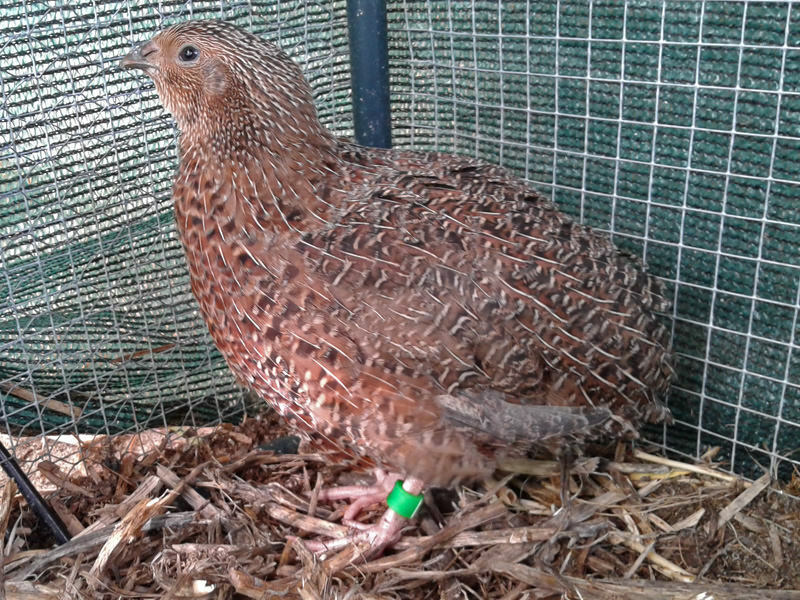 For me the quick fix when sexing 'not sure' quail at 7-8 weeks was to put them individually in a small bird cage round the corner well out of sight of the big pens for a few minutes. That would always start a male crowing (penny whistle warble). So takes a bit of time to get through fifty or so - but no longer than standing there analysing fine differences in shape and colour - and was positive and accurate, saving a lot of percentage error in guessing. I think like roosters some don't crow in a large pen, maybe intimidated by stronger males so they keep a low profile. Separating them out to take photos seems to have a similar effect. I find vent sexing/ foam production really easy once they are mature/laying.